Velocity Websites are search engine optimization specialists who can help businesses like yours dominate competitors in Google search results and other online digital media channels. If you want to be successful online you can't ignore a SEO program when over 90%* of website traffic comes from search engines and 75% of people ignore the ads from these searches. Are you looking for affordable SEO for your small business that gets results? Then you have come to the right place! We design and optimize your site to generate profitable traffic from Google, online directories and social media sites. We will charge a lot less (Thousands of dollars in some cases) than other website agencies for our design & development work, and you pay a very small amount for new visitors to your website each month. Over time we make that money back while you enjoy a consistently high ranking website. Plus we don't charge for updates. We will keep your website fresh and relevant and most importantly optimised for the search engines ever-changing ranking algorithm. For example, your new Velocity Website captures 50 NEW(unique) B2B website visitors per week, that would cost $25 per week! Image 50 customers walked in the door of your store and the next month another new 50 people who have never visited your store walk in and all you paid was $25! That's what we are offering for your online store or website! What if I get too much business? Put your prices up. Make your business more profitable. Find a subcontractor to do the work. Grow your business! Employ more staff. Grow your business fast when you have the confidence in regular traffic to sales and conversion metrics. That’s how simple it is to get the most out of your new website. Of course, you can still make changes and updates at any time and from any place, by using our award-winning content management system. Wake up in the night and need to make an urgent change to the site. You can do that on your tablet or iPad! Business to Consumer – BCB leads from 20 cents per unique user. Business to Business – B2B leads 40 to 50 cents per new unique user. Plus search engine optimization SEO Packages for all the benefits you get will with a Velocity Website. 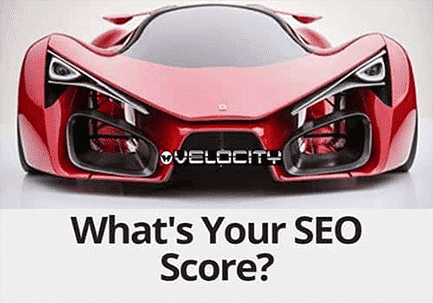 Velocity Websites - SEO Christchurch NZ - We are optimisation specialists. Contact us for cutting-edge SEO web design and search engine 0ptimisation. (It only takes 15 seconds)! Velocity Websites has affordable web design, SEO and web marketing packages for Page 1 results and small business growth. Check them out! See our Christchurch case studies! Do you want better local SEO search engine results? It is estimated by Google that 1 in 3 searches are local searches. (i.e. have local intent) … and 78% of local-mobile searches result in offline purchases! We create an environment to achieve quality traffic and partner with Christchurch and NZ businesses that are willing to do what it takes to dominate their industries in the search results. Together we ensure that the sites content is useful, relevant and engaging to it intended audience. We continually improve and refine this content based on detailed monthly traffic & conversion reports. For everything you get with a Velocity Website. See our All-in-One, pay as you GROW SEO, Web Design & Digital Marketing packages. Don't let your competitors beat you in the rankings!